Join My Team/ Weekly Deals from Stampin' Up! Hey Stampers! I hope you are all ready for a fabulous, fun Fourth of July coming up Wednesday here in the US. We're going to be hanging by the pool with kids, grandkids and grandpups! I just had to share this picture one of my stamping friends in Alabama sent to me of her cat, Milo. Speaking of happy place, we've got some awesome July specials going on right now! I invite you to pop on over to my online store and check them out…here's a little preview! There's something for everyone! Stamping, Scrapbooking, Kenya…WHAT? Happy Friday Stampers! Before I started writing this post I was looking at Facebook. Okay, I spend WAY too much time doing that, but Facebook is one way Dave and I keep up with friends and family that live outside of the state of Texas. Two of our friends, Jeff and Stephanie Bys, are missionaries in Kenya. We all used to go to church together and Stephanie was in one of my stamp clubs. She loved to create beautiful cards and became quite good at it. I remember scrapbooking also piqued her interest from time to timel. We've kept in touch through the years, even when stamping wasn't on her “front burner”. Instead of a stamping project or Stampin' Up! special, I wanted to share a bit about their story with y'all today. Stampin' Up! is involved with many charities and it is one of the reasons I love what I do! I hope you enjoy this little peek behind the curtain into another part of my life and enjoy some thoughts from Steph! You are probably tired of my sunset pics and my posts gushing about how much I love this life, but here's another because this life and these sunsets are too good not to share. The longer I'm here living this life the more I realize that my whole life has been preparing me for this work in Kenya. That might sound wonky or out there to some of you, but I'm just certain that this is the case. As a child I watched my Momma 💜 try and save my Dad. Others would quickly give up on him and rightfully so because he was a BEAR. For 14 years she stayed with him trying to save him, trying to save our family. As bad as things were she just kept thinking he could change. She just kept trying different things to make our family work. I have that same “they can be saved” mentality. In large part Kenya has given up on saving these boys who live on the streets, I refuse to accept that. I've seen first hand how great these boys can be and what a blessing they are. A couple of weeks ago we took in an older teen girl who was in terrible shape. Some of our team tried to send her back where she came from because they were afraid she would die here (they were really trying to look out for us 💜). She needed a lot of help (She has been to the Dr and talked with a counselor). Usually when we take in new children we go as a team, but this time it worked out better for her to just come here with our social worker since she was staying near where he was going to be that day. I was not prepared for her condition, I was actually shocked, but I refuse to give up on her just because her current status seemed terrible. Someone had failed this girl, someone should have gotten her help a long time ago, but we couldn't let that stop us from trying. In just a couple of weeks she has made huge changes and is well on the road to recovery! As a child I wasn't protected the way I feel children should be protected, so as an adult I became a voice for children. As a child I needed an adult to be my voice, because my voice had been silenced. You will never see me keep quite when a child needs a voice. I've been in some hard situations, but speaking up for a child is always right. I can't tell you how many adults we've had to “get on to” over the boys on the street and our boys. Most of the boys living on the street in Bungoma know us so they flock to us when they see us. If we are in an area we don't frequent then a guard will almost immediately start to threaten to beat the boys. We have to calm the guard down and tell him/her that we know them and we are friends. I can't tell you how many conversations we've had with teachers, pastors and people in general where we've had to speak up for our boys. Sometimes it is hard and very uncomfortable, but it is something that must be done. These children deserve a voice so I will use mine since usually people will listen. In my marriage we've been through some really tough stuff. Marriage is hard enough, but when you add in all the baggage we brought into it, it makes it almost impossible. My marriage has has shown me just because things are hard right now doesn't mean they will always be hard. It has shown me that even though something has ugly parts that it as a whole can be beautiful! It has shown me that you can't just give up because something is hard. Aside from Jesus, Jeff is the best thing that has ever happened to me. Seriously, I know that sounds cheesy, but it is true. Without Jeff I wouldn't be where I am today (in all areas of my life, not just my physical location). So while this first year of Kenya has had many hard times I know it won't always be hard. While we've had many hard days, we've had many, many more beautiful days! I can't tell you what a blessing it is to be able to actually live out my purpose daily. If you know my story or even part of it, you know some of it has been incredibly hard. I wouldn't change it, not any part of it because I know it has made me who I am today. If I hadn't walked through some of the fires that I have I wouldn't have learned the things that I've learned. If Jeff and I hadn't worked through all we have worked through we would be the team we are today. This past year I have really been learning how to count it all joy. While I'm not perfect at it, it is much easier to see now than before. Thank you a million times over. We are SO, SO, SO blessed to be here serving Him and our community. Without your support this wouldn't be possible. We never take this for granted and this is never an “us” thing. We always tell others that the money comes from our donors, not us. We are just here on the ground and the faces they see, but there are MANY others actually supporting this work. I love Stephanie's transparency! And to think our friendship started from one little rubber stamp! If you are interested in learning more about their ministry and adventures in Kenya, I encourage you to follow them on Facebook. You will be encouraged and blessed! If you're not a subscriber to my monthly email newsletter, you're missing out on some cool gifts AND regular fabulous monthly content!! Sign up now in the big, coral circle so you'll receive your goodies right away!! Welcome back for my lesson to help you save time in your card-making. I don't know about you, but there are many times I need a quick card and I have to come up with the design and cut all the paper. With this technique, I cut my colored card stock and my neutral card stock ahead of time so all I have to do is grab a few pieces, stamp away, and, Voila!, my card is ready! 1. a neutral colored "layer" on which your image is stamped. In my Thank You card I used Whisper White. On Saturday, I'll show you another card I made, using Very Vanilla as my neutral color. 2. a colored piece of card stock on which the image is "layered". 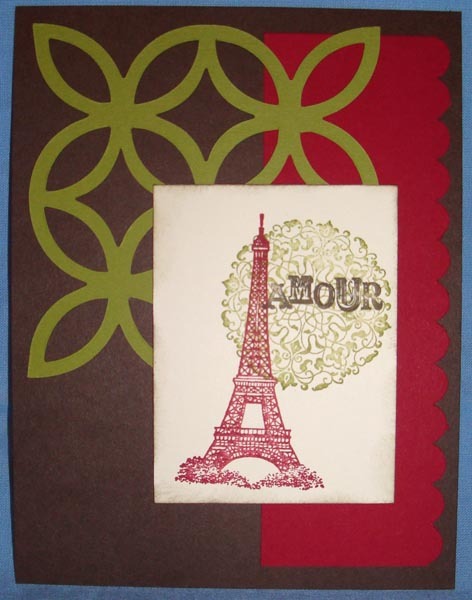 3. the card base; usually a second color that coordinates with the layer from #2. When I am choosing my colors, I keep my "Color Coach", (120148), handy. I love using this tool because it helps me come up with color combos I would not ordinarily choose and yet end up loving! Cut each piece of 8 1/2 x 11 card stock to 8 x 10. 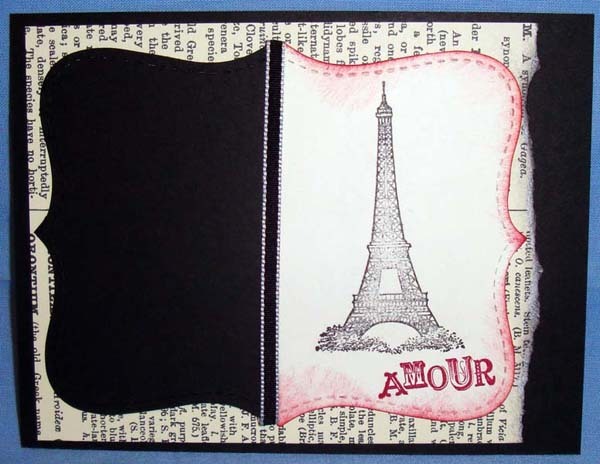 (Save the pieces you cut off–they are the perfect size to use for stamping and punching greetings, (i.e. with Teeny Tiny Wishes and Word Window Punch). Then cut this piece in half vertically – you will now have 2 pieces that are 10" x 4". Now cut each of these pieces in half; you will have 2 pieces from each half that are 5" x 4". Now cut these in half and you'll end up with 8 pieces that are 2 1/2" x 2". In my Thank You card, this is the white piece on which "thank you" is stamped. Notice in the photo below, one of the layers for the flower is stamped out of the left-hand side of this piece and my "Thank You" greeting is stamped on the right side. The focal flower image is placed over this cut out piece, saving paper. This was such a "lightbulb" moment for me….I am constantly grabbing pieces of paper from which to punch out things and I end up wasting a lot! 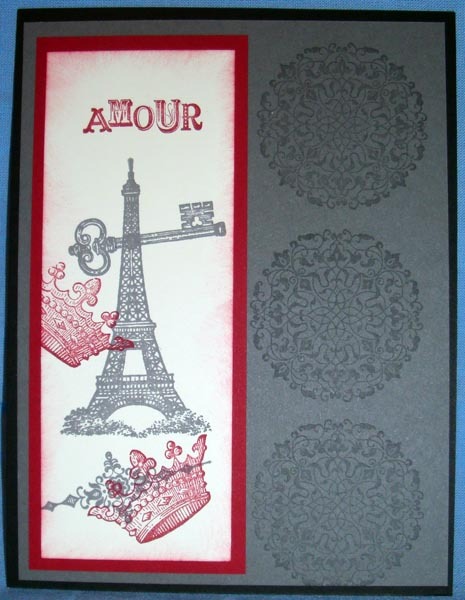 The patterned paper is from the Regals Collection Designer Series Paper Stack. Again notice the largest "petal" of the focal point flower is cut from this piece and then the other pieces are layers on top…again…no waste! Cut each piece in half length-wise at 4 1/4". Then cut each half in half at 5 1/2" and then in half again at 2 3/4". You will end up with 8 pieces, each measuring 4 1/4 x 2 3/4". If you get in the habit of cutting your pieces for your layers and your card bases ahead of time and storing them in a container, you will save SO much time. I'll be showing you more cards, now and then, that use this technique for the basic layering but of course there is lots of embellishing that will step them up! OUR BIGGEST ONLINE EVENT OF THE YEAR! I hope you find some things you like. Any questions, send me an email or give me a call. I don't know about you, but I'm always looking for a new, cute way to package my treats for visiting ghosts and goblins on Halloween night. My friend Angela came up with this adorable little container and we all made them at a group gathering at her home the other night. We used Concord Crush Card Stock with our Milk Carton die (117310). One tip when using this Bigz die, it works best with the Premium Crease Pad (or Extended Crease Pad). We embellished using a stamp from Seasonal Sentiments (120821) punched out with our Extra Large Tag Punch (119866), and finished with some DSP, ribbon and a mini Library Clio. 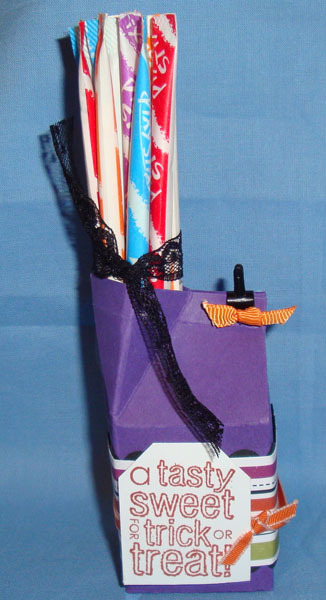 Of course, it wouldn't be totally complete without a treat…we used Pixie Sticks. I hope this gets your creative juices flowing. I'd love to see what cute, little treat holders you come up with! We've heard from so many of you that you enjoyed our recent video series…thanks for the great feedback! We enjoyed doing them and will be releasing a few more very soon! Please leave us a comment with suggestions for future topics and we'll try to incorporate your requests into our next round! If you have been stamping for awhile, chances are you have our Many Marvelous Marker Set, our Watercolor Wonder Crayons, and perhaps our Stampin' Pastels Set. Suede, Melon Mambo, Basic Gray, Sahara Sand, and Very Vanilla. You can just take out the retired colors, pop in the new ones, and you are ready to start creating…no need to purchase an entire new set! You can find more details on the Stampin' Pastels on page 194 of the 2010-2011 Idea Book & Catalog. This product is available online by visiting my online store and selecting the following links: "Ink-Cetera" on the left-hand side, then "Pencils & Pens". Also, you can enter “Stampin' Pastels New Color Kit” in quotes in the search box in the top left corner. The hostess of a recent workshop got $105 in free stuff …yea Kristy! Kristy had a long wish list and one thing on her list was our new Word Play Stamp Set. I told her that I thought this would be a great one! I had gotten this set for free during our annual Sale-A-Bration promotion, (another reason that I love having my own stamping business…), and I know she will love creating one of a kind cards. Here's a quick and easy Get Well Soon card, created with her set. 1. Fold Marina Mist Card Stock in half to form card. out portion of circle using 2-1/2" Circle Punch. Adhere to card. 3. Stamp sentiment in Wild Wasabi ink on Whisper White Card Stock (3" x 3"). Punch out using Decorative Label Punch. 4. Cut out arrow from Pumpkin Pie Card Stock and adhere to Whisper White Card Stock. 5. 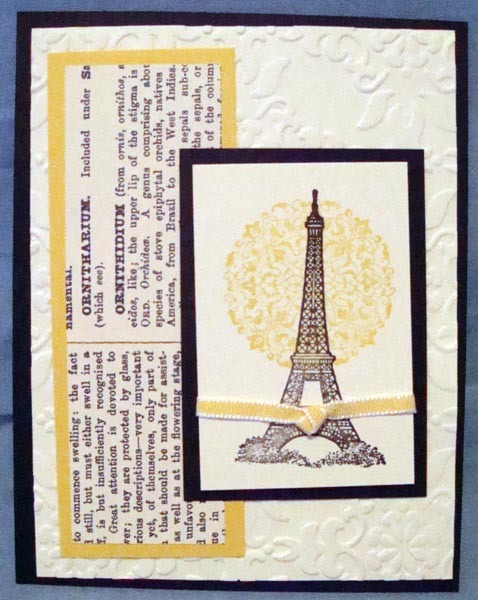 Adhere Whisper White Card Stock to front of card using Stampin’ Dimensionals. Would you like to 'earn' Free Stuff while having fun with your friends, getting new ideas, and learning new stamping and scrapbooking techniques? It's easy! Call me at 972-234-9118 or send me an email and ask me about hosting a workshop. Twenty three days? What's up with that? We are right in the middle of our fabulous hostess promotion but time is running out. From now until August 31, hold a qualifying Friends Night Out Workshop (hands-on stamping projects included!) or Catalog Party and get more free stuff! With sales of just $350, you will get $60 in free hostess merchandise instead of the usual $35. Now, $35 of free stuff is terrific in itself, but adding more is even better! Here is a little project made with one of our Level 2 hostess sets…you would also get this set for free, too (or one of our other offerings instead if you choose)! I only have 3 dates left in August that I am available to do a hands-on workshop so contact me soon to have first choice! So You Think You Aren’t Creative? I had a Stampin' Up! Workshop a couple of days ago with 2 "newbies" in attendance. When my hostess invited them, they were quite hesitant because they weren't "creative or crafty". I am so glad they came (it was lots of fun stamping with you, Laurie and Christy!) and by the end of the afternoon they had stamped three cards and were ready for more! Here is one of the cards we created using our exclusive Sizzix Top Note Die and our Cupcakes Stampin' Around Wheel. I get re-energized every time I can share my love of stamping to someone who has never tried it. I have new stamp clubs forming all the time and also teach lots of classes (see my current offerings by clicking the "classes" link above. “Whoo” Loves Our New Owl Punch? I sure do! This little two step punch creates the cutest owls but has other uses, too! You can make a tulip flower and also get different sized circles you can use for lots of other projects!